In this exquisitely dark debut, Kate Howard delivers a stirring tale on the cost of beauty, packed with suspense and period detail worthy of Kate Mosse, Jessie Burton, and Tracy Chevalier. Cursed from birth by the bird-shaped blemish across her face, Flavia spends much of her life hidden from the outside world. Lonely and alienated even from her family, she sabotages her sister’s wedding in a fit of jealous rage and is exiled to serve in the convent of Santa Giuliana. 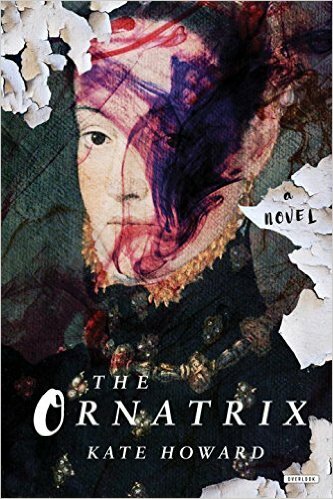 Soon she finds that another exile dwells in the convent: a former Venetian courtesan named Ghostanza whose ostentatious appearance clashes with the otherwise austere convent and sparks gossip throughout the town. When Ghostanza claims Flavia as her ornatrix―her personal hairdresser and handmaid―Flavia is pulled into a world of glamor and concealment where admiration is everything and perfection is the ultimate, elusive goal. And she soon finds that with beauty in her grasp, in the form of the poisonous but stunning white lead cerussa, Flavia will do anything to leave her marked face behind. Rich in description and character, Kate Howard’s stunning novel is painted against a vivid historical landscape with themes and characters relevant today, tackling issues of belonging, female identity, and the perception of beauty. For those who follow me on my blog or social media, they know that I love Italian Historical Fiction. It is my favorite genre. But when it is on the dark side, with plenty of intrigue and grit, there can be no better story. I loved every element, every page, and every word of this well-plotted book. First, there is an appealing protagonist who struggles to gain acceptance because of a large birthmark on her face. It ostracizes her from society. She lives in a convent and encounters the protagonist, a Venetian courtesan named Ghostanza who is obsessed with beauty and her secret recipe for cosmetics where the ingredients are sent to her via an apothecary in Venice. Flavia becomes Ghostanza's Ornatrix (maker of cosmetics). Of course, the make-up is mostly made of lead as was typical of the time, and Flavia soon notices how it ravages the face of her benefactor. Despite the risks, Flavia yearns to use the cosmetic on herself to hide her birthmark. This novel is a tale about the lengths and risks a woman will take order to be beautiful. I especially enjoyed the start of each new chapter or section that highlighted a quote or recipe about an old beauty trick or cosmetic. This fictional story taught me much about the beauty procedures of the past - hair styles, depilatory processes, plucking of hair above the forehead, face creams, lotions, and more including the cerussa paste for the face. Beauty, murder, intrigue, vengeance, and a cast of fascinating and unpredictable characters along with a scintillating plot made this one of my favorite reads of 2016!